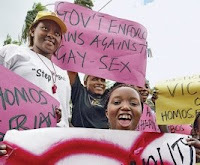 On December 7, Faith and Public Life released a statement condemning the anti-gay bill in the Ugandan Parliament that submits homosexuals to draconian punishments for their "crimes." Sadly, many prominent Christians have refused to speak out against the human rights abuses enshrined in the legislation. Faith and Public Life, however, produced an eloquent statement on Christian responsibility in the face of oppression--and gathered an impressive, inclusive, and diverse list of signers to support their plea to treat homosexual persons with dignity and respect. Despite how fractured the faith community can be, this statement shows that Jesus' call to love our neighbor as ourselves can unite Christians in the face of moral evil.